(Please click on thumbnails to see large pictures). 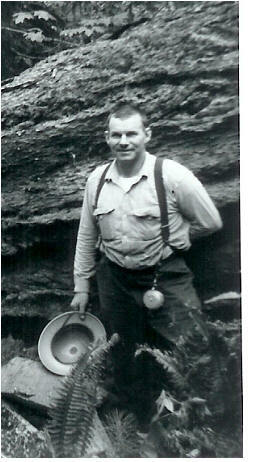 Russell Aaron Yoder was born May 26, 1921, in Oregon City Hospital to Edna and Aaron Yoder of Yoder. Youngest of three boys, he was a brother to Nolan and Emerson. Russell attended Yoder grade school and graduated from Molalla High School in 1939. Since Oregon had dropped the age for driving by one year to drive to school, Russell took advantage of this and got his driver’s license at the age 15. His plans to drive that fall were interrupted by the first school bus available to the kids in Yoder. He worked in the ship yards after graduation, and with the country at war and the draft approaching, he signed up for the Sea Bees of the Navy in 1942. On the train trip to boot camp in Rhode Island he met Vernon Sinclair and Phil Lake, who became good friends while serving together in Dutch Harbor, Alaska and Saipan. Upon returning from the service, he partnered in the Yoder Mill venture and enjoyed a career of cutting trees. A common family “outing” would be going to the woods to watch Russell cut down a big tree. It was after the service that he began courting Dorothy Freeman. Russell was never much of a hunter but did make a deer hunting trip with his future father in law, Ted Freeman. We were never sure who actually shot a deer on that trip, but thereafter Russell would say he did not need to go hunting as he had already got his “dear”. Russell and Dorothy’s engagement was announced soon after her graduation from Molalla High School, and they married in August of that summer of 1948. He and Dorothy set up housekeeping nearby his family home and lived together there for the next 57 years. Soon they started their family which eventually grew to 6 children, Judy, Jim, Mary, Vernon, Beverly and David. Russell was a good provider for his growing family, and while not a farmer, he did keep enough pigs, chickens and sheep to provide chores for all of those kids. He had a nut orchard and between his nieces, nephews and children, he had a work crew for the fall harvest. His growing family soon was getting too big for the old house, so he moved it down the road and built a new one according to Dorothy’s design. This house had room for everyone and everything. Russell’s love of different wood types is seen in fir floors of the bedrooms, knotty pine walls in the family room, and ash in the living room. Heating this large home with a wood-fired furnace was a big job that he did well. Because he worked outdoors and got cold, he liked to keep the indoors at a toasty 80°to 90°. Russell took his family on many vacations. The beach outings are too many to number. In the summer of 1962, he packed up his family and drove to Alaska with a look at possibly relocating. In 1968, he wanted his family to have the experience of riding the train, so the family rode east to Chicago. He purchased a new station wagon and the family vacationed on a long drive home. As the children grew and set out on their own he and Dorothy continued traveling. There were many train trips, and some train trips to see other trains. He had a fascination with steam locomotion and spent many hours “working” with his steam engine at the Brooks steam up each summer. Throughout his life, he was a supportive and involved member of the Smyrna Church, founded by his parents and grandparents. One summer he brokered a deal with the UCY, Smyrna’s Youth Group. The teens watered and mulched the newly planted trees next to his home in exchange for the use of a rental home as a youth hang out, “The Beet”. Russell was very community-minded. He was a member of the Rural Dell School Board for many years, helped organize the local volunteer fire department, and supplied water to various residents of Yoder. Whenever something needed to be done, he was there. Russell's life was centered around his family. One hobby that he had was making homemade ice cream. Every event usually featured one or more flavors of this favorite specialty. He started with hand-cranked freezers and evolved to using electric power to churn the rich treat. However, ice cream alone was never considered dessert. Ice cream was what you put “on” your dessert. Lucky for all, he married an accomplished pie baker. Enjoying his children and his grandchildren and in these last years his great grandchildren, Russell was content surrounded by his family.